Are you planning to take a safari in the near future? It goes without saying that Africa offers you the best options in terms of safari. The terrain, weather, and wildlife on the continent are unparalleled and you will have the experience of a lifetime. There is a common misconception that the entire continent is similar in terms of safaris. This isn’t the case. Generally, people head to Tanzania for a safari but many wonder if South Africa would prove a better option, as it is a developed country with a better infrastructure than Tanzania. In terms of wildlife, there is no comparison. Tanzania has the highest concentration of wildlife in Africa, making it a far superior option if the primary reason you are going on a safari is to be closer to animals. Not to mention, there is a good chance you will be able to see the ‘Big Five’ species of animals, as they are referred to. These include black rhinos, lions, African buffaloes, elephants, and leopards. This is not surprising, given that almost a third of the land area of Tanzania is made up of protected nature parks and conservatories. In comparison, only 6% of South Africa is protected. 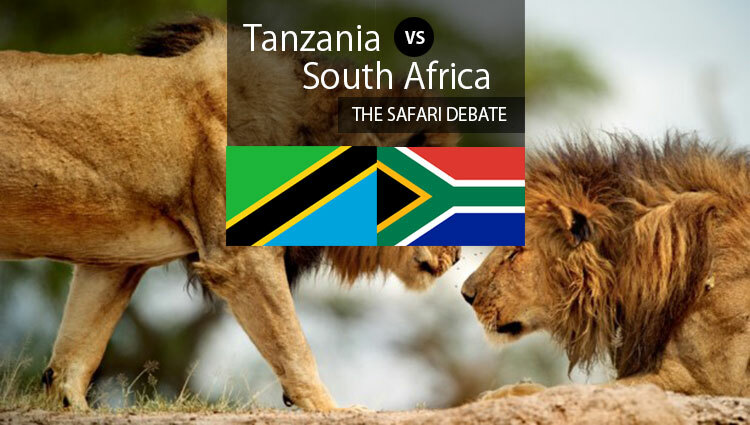 Also, Tanzania has close to 1,000 more lions than South Africa. It is a breathtaking sight when animals are migrating. However, this migration happens only in East Africa, where Tanzania is located. This is something you will not get to see if you head to South Africa on a safari, which again means Tanzania is a superior option. Just to make things clearer, 80% of the entire migration in East Africa occurs in Tanzania, which means there is no better place in Africa to watch the Great Migration up close. In terms of weather, Tanzania has a fairly temperate climate throughout the year. There is little variation between the seasons. There are a couple of months when the rainfall is heavy, but barring that, the weather is pleasant and will add to the experience of the safari. On the other hand, South Africa has a seasonal climate, which means it can get extremely cold or hot, depending on the current weather. This can make staying there difficult. Not to mention, who wants to go on a safari when it’s freezing cold out there.? South Africa, being a fairly developed country, offers superior amenities in terms of camping and lodging. The facilities are first-rate but this also means people who want to enjoy the authentic camping experience, i.e. staying in a tent, won’t find that option in South Africa. Tanzania offers both luxury and tented camping safaris, so you are free to choose whichever option appeals to you the most. And unlike common perception, staying in a tent is safe and you won’t be ravaged by mosquitoes and bugs. Having gone over these factors, it is quite clear that Tanzania offers a far superior safari experience than South Africa. If you want to head out on the safari of a lifetime, Tanzania is the place to visit. Not to forget, you will a number of other activities which you can enjoy after your safari is over, which include visiting the beaches of Zanzibar and exploring the history of the city.